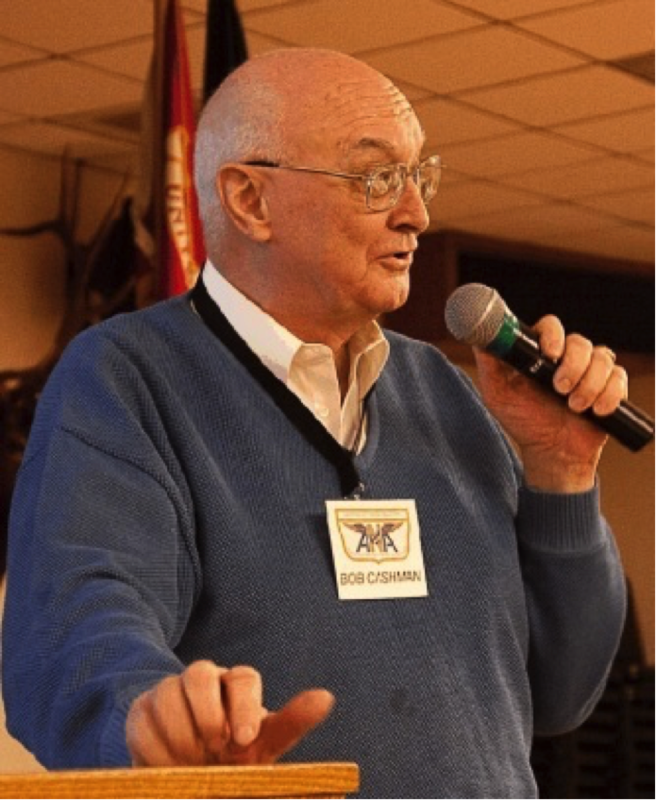 The Grampaw Pettibone Squadron was honored to have one of our squadron members, Mr. Bob Cashman, share his knowledge and experience in the search, research, construction and flight of a full scale Nieuport 28 aircraft. Cindy Macha, GPS Ops Officer introduced our speaker. 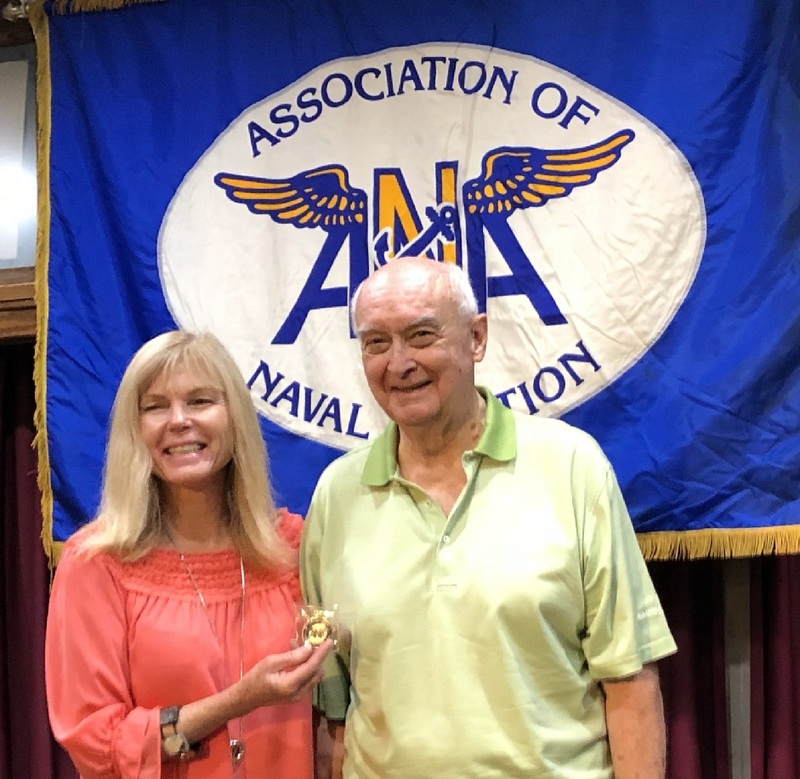 Bob began his talk focusing on his early life, his family and the connection to his love of aviation. Bob had an uncle, George E. Fuller, who he described as a ‘wild guy.’ His uncle in his early years built cars with a group of friends and raced them before WWI. His uncle’s partner was Eddie Rickenbacker, WWI ace and major contributor in both automotive and aviation industry. Other members of his uncle’s group of friends were Louis Chevrolet, David Buick and other notables in the young automotive field. The early days of US military aviation went through a series of growing pains. A military demonstration flight with Orville Wright at the controls and an on-board observer, Lt. Thomas E. Selfridge in a Wright Flyer in 1908, did not end well. During the flight, the aircraft experienced a malfunction and crashed. Orville Wright was injured and Lt. Selfridge died from his injuries, to become the first military aviation fatality. The crash did not stop the eventual acceptance of the aircraft as a military tool and by the time the U.S. entered the war in 1917, there were 39 aircraft in the U.S. inventory. According to Bob, the U.S. fleet grew to over 500 aircraft and continued to grow after the US entered the war. However, creation of the air corps encountered some issues when it was proving a challenge to find individuals willing to fly. According to Bob, neither George Fuller nor Eddie Rickenbacker would join the Air Corps. After a bonus was offered they and others joined the new Air Corps. Bob described his interest in aircraft of this period after hearing the ‘fantastic stories’ from his uncle and his uncle’s friends. As previously noted, Eddie Rickenbacker was one of the friends and went on to achieve success after the war in many industries. During the 1930s, Eddie Rickenbacker stayed in touch with Bob’s family, visiting and entertaining Bob with his stories, leaving memories of his service to include various WWI related items; (ie; helmets, leggings, ammunition belts, etc.). This is what introduced our speaker to the WWI scene. 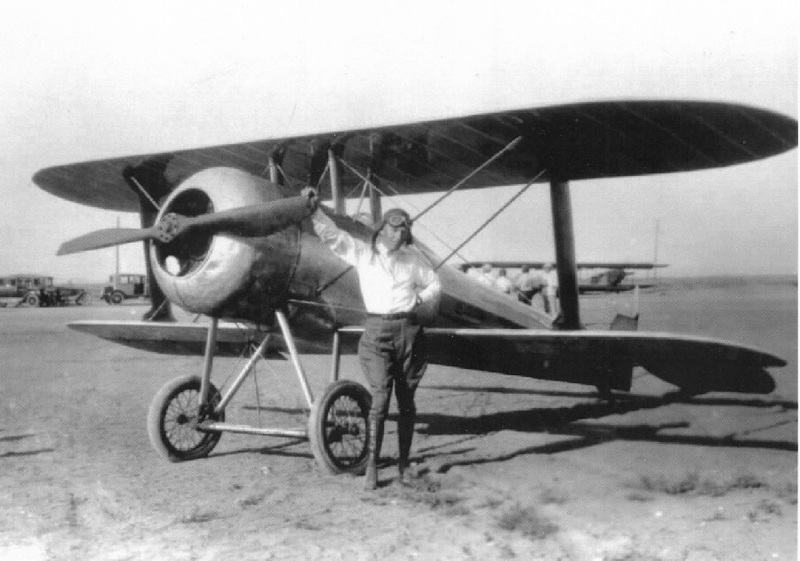 Bob’s involvement with the Nieuport 28 began in 1985, while serving as a Commissioner for the County at present day John Wayne Airport. Bob received a call from the Smithsonian Institution. The Institution was looking to contact Eddie Martin and interested in acquiring or building a Nieuport 28 aircraft. Dr. Richard Hallion was the representative from the museum and worked with Bob in his search. Bob volunteered to search for a plane while expenses were paid by the museum. According to his research, there were 3 originals still on display at that time; one at the Boeing Museum on loan from the USAF, a second at the museum in Dayton, Ohio and the third at a museum in Zurich, Switzerland. None of the aircraft were available for sale. Bob indicated that the Swiss plane was acquired during the war when the pilot seeking sanctuary, flew to Switzerland. While the pilot was released at the end of the war, the plane was kept. Through further research Bob located an original Gnome engine for the plane. This is a 300 pound, 160 hp rotary engine. There were five versions built during the war. 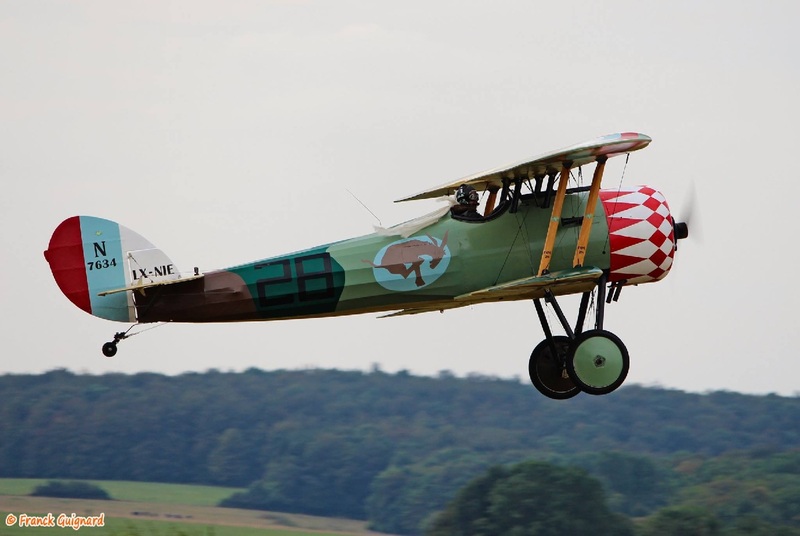 Originally designed by a French engineer, later sold to a German company and used in a number of military aircraft on both sides of the war; most specifically the German Tri-fokker and Nieuport 28. Bob’s travels took him to Rhinebeck, New York to visit Cole Palen’s Old Rhinbeck Aerodrome. The collection at this living history flying museum had a selection of over 60 aircraft from the Pioneer, WWI and Golden Age of aviation. Original as well as extremely accurate reproductions. The collection had a few pieces of a Nieuport 28, including a tail assembly still with fabric covering. By mentioning the Smithsonian Institution, access to lesser known sources began to open up. The search took Bob and Dr. Hallion from South Florida at Kermit Weeks museum to Rheims , France. The result of his travels did not discover any available authentic Nieuport 28 aircraft for sale and his research disclosed that the majority of aircraft returned to the US at the end of the war were used as props in Howard Hughes movie, Hell’s Angels. The few that were only damaged turned out to be copies built by Bill Appleby from Antique Aircraft at Flabob airport in Rubidoux, CA. Bob indicated Bill Appleby may have built as many as 45 aircraft for Howard Hughes. Bob’s continued research revealed that of four copies of the aircraft located, a single copy built by Bill Appleby was built and is on display at the San Diego Air Museum. The outcome of his search indicated that the Smithsonian would not accept any of these copies of the Nieuport 28. While the museum had a decision to make regarding a plane; Bob decided that in view of the fact a Nieuport 28 could not be acquired, and the aircraft appeared of simple design; why not build one. After acquiring plans, he proceeded to build his plane locally. A photo of his second plane was shown which was built in about six months. A New Zealand company builds traditional radial engines that look exactly like a Gnome engine. Bob purchased one engine for his plane. While the original aircraft were of wood and fabric construction, Bob’s replica was an aluminum tubing frame, body riveted and built accurate to the original French plans. It has a 27 foot wingspan and can fly at 100 mph, however, the first plane that Bob built did not fly well. A test pilot was hired to fly Bob’s plane after it was built. The original planes were described by the first pilots who flew them in the war as an agile and reliable plane. It is often asserted that rotary engines had no throttle and hence power could only be reduced by intermittently cutting the ignition using a “blip” switch. This was almost literally true of the single valve type, which took most of the air into the cylinder through the exhaust valve, which remained open for a portion of the downstroke of the piston. Thus, the richness of the mixture in the cylinder could not be controlled via the crankcase intake. The “throttle” (fuel valve) of a single valve engine provided only a very limited degree of speed regulation, as opening it made the mixture too rich, while closing it made it too lean (in either case quickly stalling the engine, or damaging the cylinders). With the installation of a radial engine in the replica, there would be throttle control and the iconic blip sound associated with the gnome engine would not appear. A series of photos were shown containing pictures of the Nieuport Factory in France, Eddie Martin and his Nieuport 28, Jim Appleby and one of his copies, early historical photos and the construction steps for Bob’s planes. The Smithsonain being unable to locate an original, decided to build a replica. A photo of the Nieuport 28 on display at the Smithsonian was built by the Smithsonian at their Paul E. Garber Preservation, Restoration and Storage Facility exactly to the original plans. Bob indicates that Dr. Hallion from the Smithsonian thinks it is about 17% original. The tail section was acquired from the Cole Palen collection. Bob described a marine designer who tested the shape of the Nieuport 28 wing in water to determine the best shape for lift. The curvature of the Nieuport wing both top and bottom demonstrated the most effective design in water. The NIeuport design enabled it to achieve a top speed of 100 mph. The SPAD design softened the curvature underneath. The German Fokker design had a much flatter lower surface to the wing. Aircraft designed by Anthony Fokker, a Dutch designer were first offered to the British but rejected. Germany accepted the offer and a number of significant designs during WWI, the most famous the Fokker D-VII came out of his work. The Fokker wing design which has less curvature underneath became the basic design for non-jet aircraft and enabled the early Fokker design to achieve speeds of 110 mph. Though very maneuverable and with a good rate of climb, when dived too steeply it had a tendency to shed the fabric from the leading-edges of its upper wings. Steps were taken to strengthen the wing-fabric of the 28, and a satisfactory solution to the problem had evolved by July 1918. Research indicates the loss of fabric was due to the pull out and not the dive. Eddie Rickenbacker experienced a loss of fabric to his plane, but was able to successfully return to his base. Bob’s copy of the Nieuport 28 was built following the same steps one follows when building a model airplane. A large table was constructed, a sheet of cardboard followed by the plans for each section. This would be followed by a sheet of wax-paper and then the parts would be drawn out on the wax paper. The tubing for each section would be held in place by blocks of wood with screws. This would be followed by pop riveting and adding flanges where angle assembly was required. The first copy following the plans and weight of the original aircraft was distributed according to the manufacturer design. The construction ended up with the center of weight in front of the center of lift. The plane would not fly straight and level without power. Once the power was turned off or cut back, the plane would nose over. Bob admitted that the first attempt was a ‘disaster’. Through a series of referrals, Bob was put in touch with a replica builder from Kansas City. Through this builder’s contacts, a Boeing engineer provided technical assistance and a new set of plans and a second aircraft was built and flown successfully. This was soon followed by a third plane. The original design had two fuel tanks, an eight gallon upper and 20 gallon lower tank. The new design increased the upper tank to 12 gallons with no change to the lower. The fuel gauge is a glass tube and the fuel transfer was a manual switch that would cause the upper tank to drain as needed to the lower tank to power the motor. Photos shown of the second and third aircraft built. Bob indicated that the replica contained two guns mounted on the aircraft which were butane powered and could fire to simulate gun fire where the butane passed thr ough an opening over a spark-plug to ignite the gas. 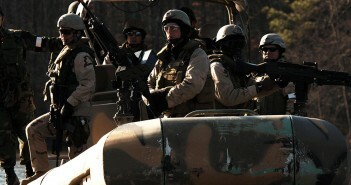 Approval by the FAA required the upper gun to be removed due it’s close proximity to the fuel tank. Bob indicates that the two flying replicas will appear in public later this year, one at Dayton, Ohio and the other aircraft at an airshow in Texas. According to Bob, a replica copy of the Nieuport 28 will come to Southern California in the near future and be on display at a local air museum.